Slashing air pollution and slowing climate change are possible—if we end our dependence on fossil fuels and instead build a clean energy future. Renewable energy sources such as wind and solar have zero fuel costs, which can save families money on their energy bills. Generating power locally creates jobs in emerging industries. And clean energy cuts pollution that worsens asthma and heart disease. Connecticut Fund for the Environment works to bring all these benefits to our communities. How does Connecticut rank as a clean energy leader? The Union of Concerned Scientists finds there’s good news—and bad news. So how do we ramp up renewable technologies? CFE advocates at the state legislature, Department of Energy and Environmental Protection, and Public Utilities Regulatory Authority for policies that encourage investments in renewable energy. Locally-generated, self-replenishing power is the solution to Connecticut’s high and volatile electricity prices, and will bring more reliable, healthier energy to the state. Connecticut’s Renewable Portfolio Standard, which guides how much of Connecticut’s energy must be from renewable sources, is set to expire in 2020. We’re pushing to extend it and set more aggressive targets. Stay tuned to hear how you can amplify this effort. Synapse Energy Economics conducted an analysis for CFE and allies showing that a more aggressive Renewable Portfolio Standard leads to more jobs and better health for the region. The Connecticut Green Bank’s energy efficiency and renewable energy generation programs, supported by the Clean Energy Fund, are the smartest investment the state could make. In 2017, the Green Bank leveraged $6 in private capital investment for every $1 of public money invested in its programs. 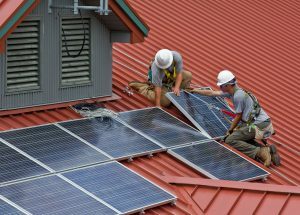 CFE works to protect these funds from state budget raids to ensure solar programs can proliferate in Connecticut. Solar for All! More solar means more jobs, a more resilient electric grid, and less pollution. In addition to utility-scale solar farms, rooftop and shared community solar are key. Right now, sadly, 80 percent of Connecticut residents can’t install solar panels on their homes. Share the Sun: Learn about our campaign to bring solar access to everyone–through shared solar. Sustainable, off-shore wind development is a better option than putting our coast and wildlife at risk by drilling on the Atlantic continental shelf. In addition to generating clean energy, offshore wind generates clean energy and also brings jobs and economic growth to port communities. In parts of Connecticut, carefully-sited onshore windmills are a viable solution, and windmill designs are growing ever quieter and more wildlife-friendly. Geothermal and solar hot water offer clean, energy efficient, and cost-effective alternatives to fossil fuel-based heating and cooling, which generate large amounts of greenhouse gases. Modernizing the power grid to support more widely-distributed electricity generation and effectively storing energy from intermittent sources like wind are key to successfully transition to a renewable-based electric grid. Your support makes our work to transition Connecticut to a clean energy economy possible.